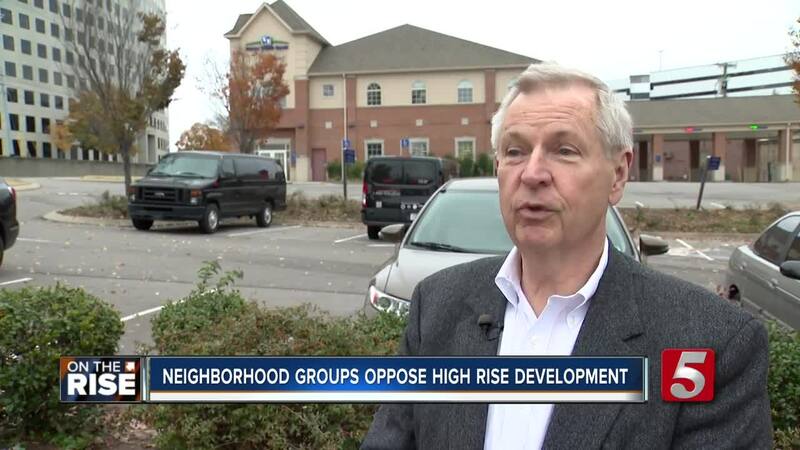 A group of neighborhood groups have teamed up to oppose a high rise development on Murphy Road near West End Avenue. A plan to build a 16 story building at 3415 Murphy Road has raised concerns from at least three associations. The developer of the property put in a request for the Metro Council to rezone the lot to allow a higher ceiling and more square footage. The "Special Purpose" zoning exception passed the Metro Planning Commission but the groups plan to attend a December 4, public meeting to plead their case. Right now, builders on the lot can only build as high as 110 feet with a max floor area of 190,000. The special purpose request would allow 207 feet and 380,000 square feet. "What we don't want is the density that comes with it," said Jim Kelley, who lives in a nearby neighborhood and is a board member for Richland-West End Neighborhood Association. "This is one of six parcels that are in this little pocket. Whatever this developer gets approved will be the starting point for the next developer. So, we could end up with as many as 5 other 207 buildings that form a wall along 440." Kelley's neighborhood is across the freeway, but the 16 story building would be visible over the low trees at the end of Richland Avenue. "It's just too big. Were the developer to build a building that's the size of the existing zoning, I think the neighbors would be very tickled about it. But the idea of doubling the height and doubling the square footage and unfortunately doubling the project is really going to make it a tough project for sure," he said. The project has already gained the attention of multiple council members. It resides in Ed Kindall's district 21, but is right on the edge of two other districts. Kindall said he's still waiting to hear all sides of the issue before taking a position. He noted that the plan was reduced from 20 stories to 16 after the developers heard public feedback. However, another council member, Kathleen Murphy, said she adamantly is opposed to the project and believes it will create traffic issues on Murphy Road and West End Avenue. "There's something like 4,000 more trips a day that will be generated by this project and there isn't the infrastructure there and not a funding mechanism to pay for that in the short term or the long term," said Murphy. A press release, jointly sent from all of the involved neighborhood groups, said that traffic is "snarled" during peak times in the area.